In a medium mixing bowl, whisk together cashew sauce ingredients until well incorporated. Set aside. Heat canola oil to medium-high heat in a large skillet. Add chicken and cook 2-3 minutes. Stir in coleslaw mix and cook 5-6 minutes, until cabbage is wilted and chicken is fully cooked and browned. Season with a generous pinch of salt and pepper. Stir in cashew sauce and simmer 2-3 minutes, until thickened. Remove from heat. Place lettuce cups on a plate. 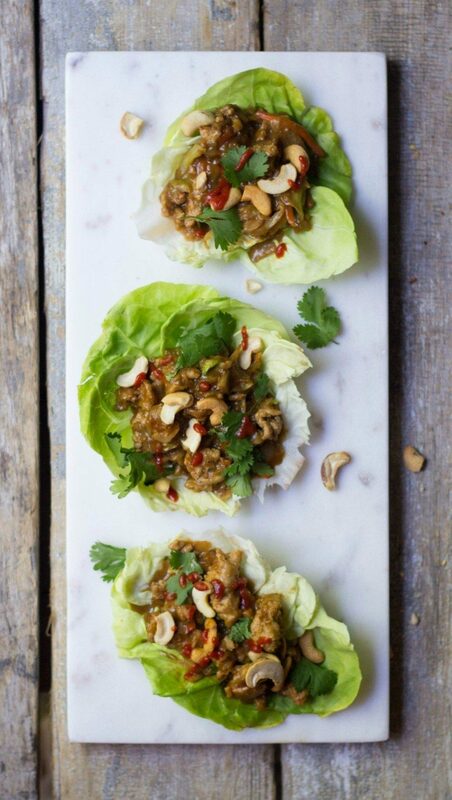 Spoon chicken mixture into each cup and garnish with cilantro, cashews and Sriracha.